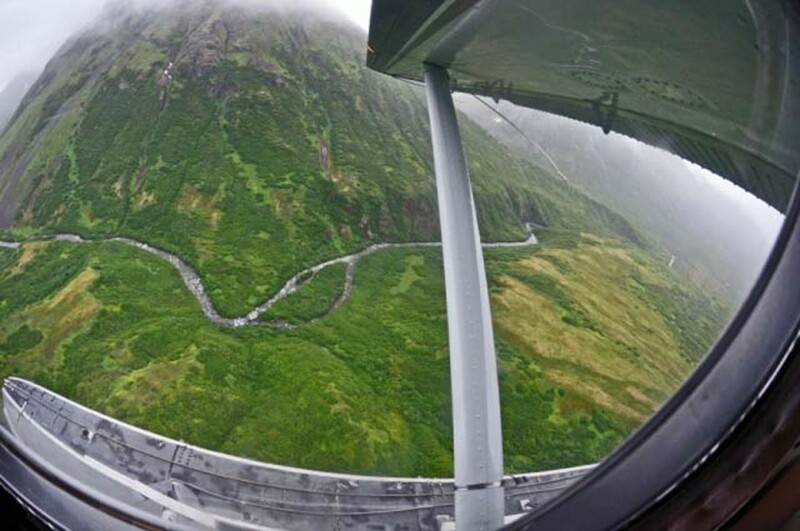 For a decade I’ve flown over this canyon on my way to other better known rivers for floating and fly fishing trips. Like Alex Rutherford and Bill Beveridge, looking down into this canyon in 2010, I wondered: Was it navigable? To research the canyon, in 2007 a pilot dropped me off so I could hike down the canyon. From June 18-20’th I hiked the upper canyon. The canyon rocks, boulders, and even the gravel were hard edged and angular. There was an absence of river rounded rock. 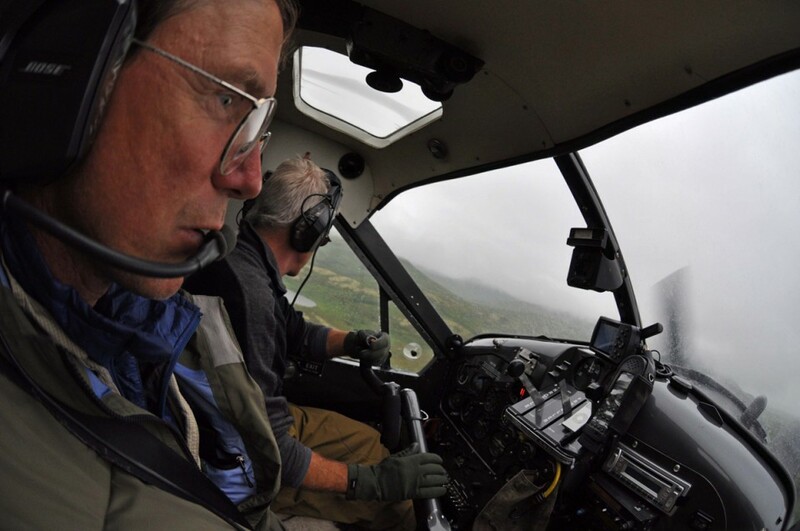 I learned from aerial reconnaissance in 2007 that at one time it probably drained the opposite direction, North West, into the Goodnews watershed or into another Kuskokwim bay watershed. But recently as the land to the west lifted when the weight of the Pleistocene ice sheet was removed, the water forced it’s way through what must be a geologic fault in the range and a canyon was formed which runs more or less straight for many miles of continuous whitewater. From my experience in the canyon in 2007 I could see why there was no record of anyone boating it. The creek when I photographed it in mid June, 2007 was very low volume. To a contemporary creek boater, low volume is just one part of the challenge. The other challenges in the canyon were: Medevac options limited to helicopter. Major portages generally not possible. Lining difficult. Boulders obstruct boat passage through rock gardens. Eddies infrequent. Rockslides force the channel through rubble piles. It seemed likely that any inflatable, even the small Aire Puma raft, 62 inches wide and 11 feet long, could not pass between boulders for stretches. 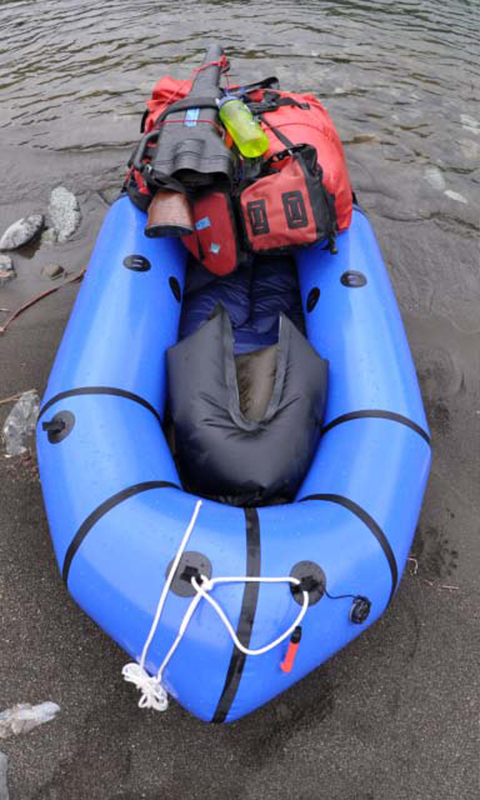 Indeed the other raft I use for creeks, the Aire Traveler which is 47 inches wide, might be too large. With all those factors in mind in the 2009 I still believed the canyon was worth a try and indeed as it turns out the first descent was boated in grand style, but not by me! 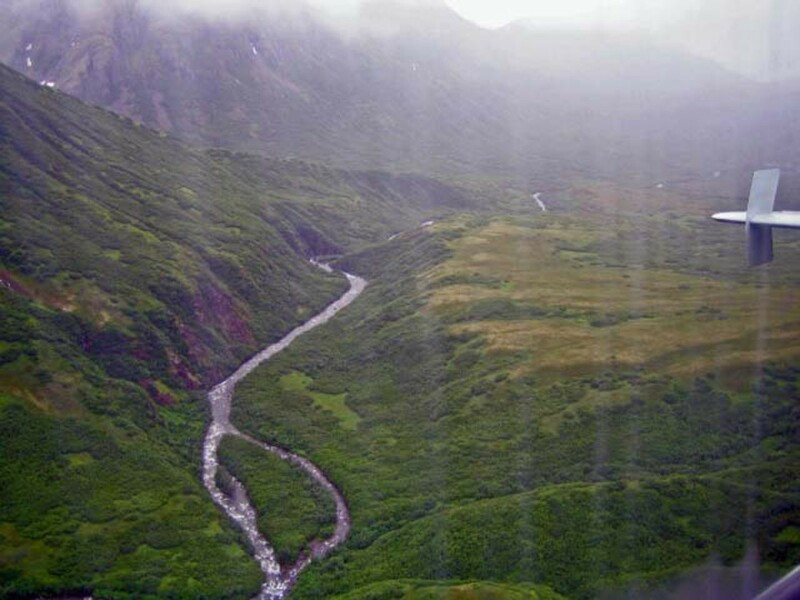 In autumn 2009 I learned that the canyon had been boated by a pair of highly experienced Alaskan boaters that summer! One of the intrepid 2009 boaters was a friend of a friend and for a few minutes I spoke by telephone with the woman who did that first descent. While I was a bit heartbroken that I hadn’t been the first one to unlock the secrets of the canyon it became clear that my conventional rafts might have failed at some point mid canyon with a very tough evacuation and the loss of some raft(s) likely. 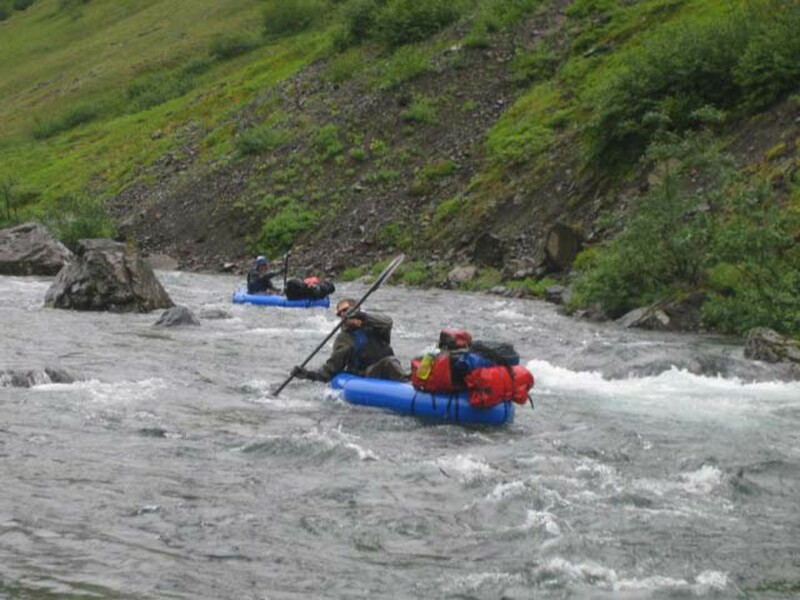 As she described the canyon, run under favorable low-moderate water flows in 2009, it was clear that the key to unlocking the canyon was the use of a Pack Raft paddled with a kayak paddle. One more obstacle she pointed out was the Brown bears. The creek is so small and drops so fast that there is a fairly good chance one will encounter a bear at close quarters before either human or bear has time to react. She had had an incident involving a bear. So that was added to our list of hazards. 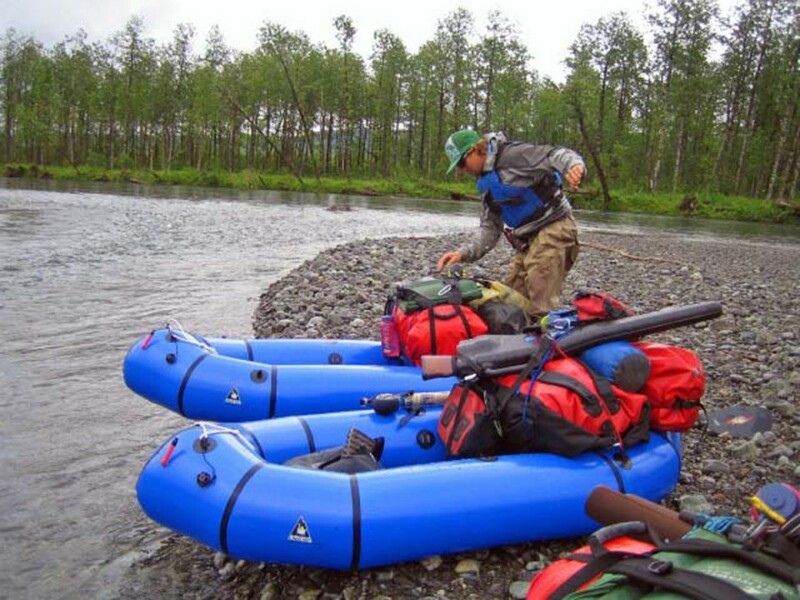 What remained then was to purchase Alpacka Voyageur pack rafts and assemble a team. 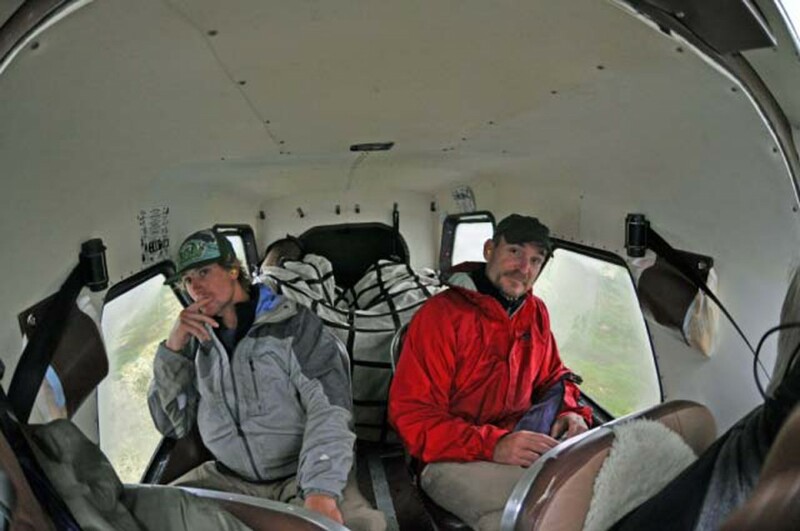 Alex Rutherford was convinced to put away his quiver of surfboards for a week and he flew to Dillingham from Kauai, and Bill Beveridge packed his dry suit and flew in from the American River in California. I took a week off. We started into the canyon on July 30’Th, 2010. 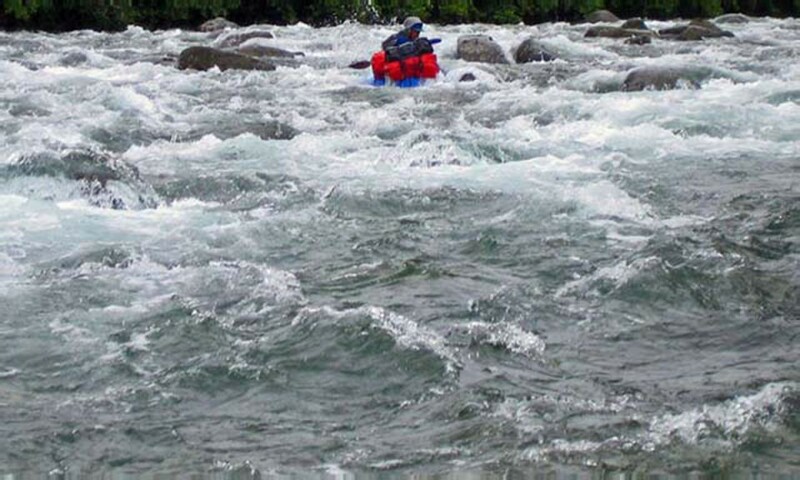 Bill and Alex are experienced whitewater Kayakers. Bill paddles Class IV+ water most years in both North and South America. Bill would lead. 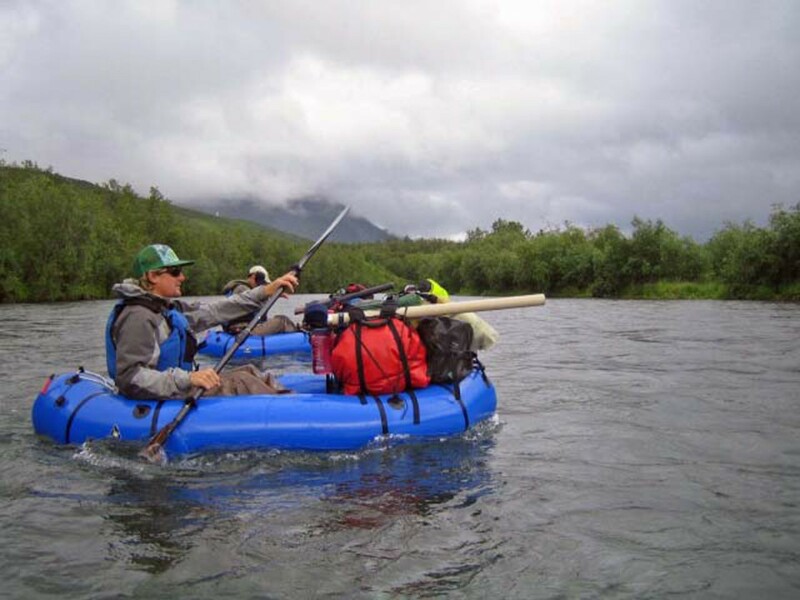 We had 3 unrigged Voyageur rafts, food and tents for a week, a can of bear spray each, one rifle in a scabbard, and a couple fly rods in case we found fish. 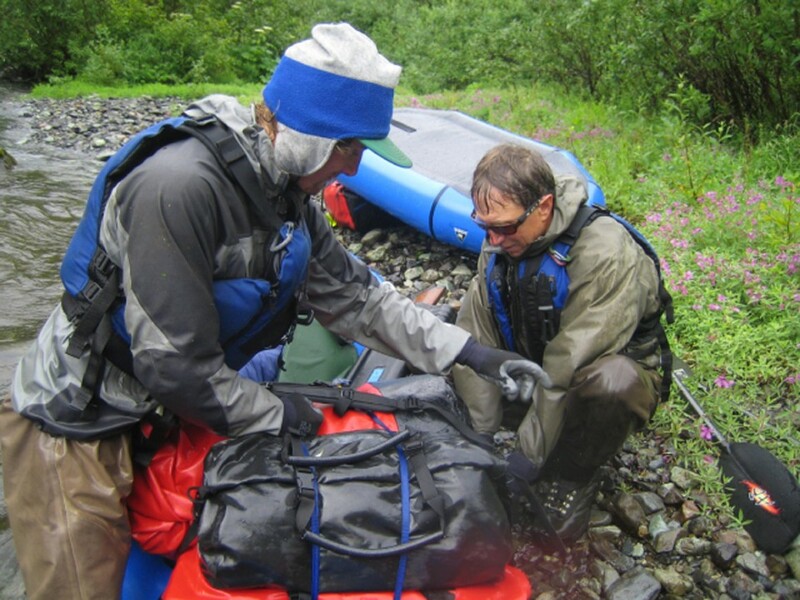 Our gear weighed 240 pounds including boats, paddles, and food. We would learn through experience that we were overloaded by 50 lbs. From the log of July 30’th. 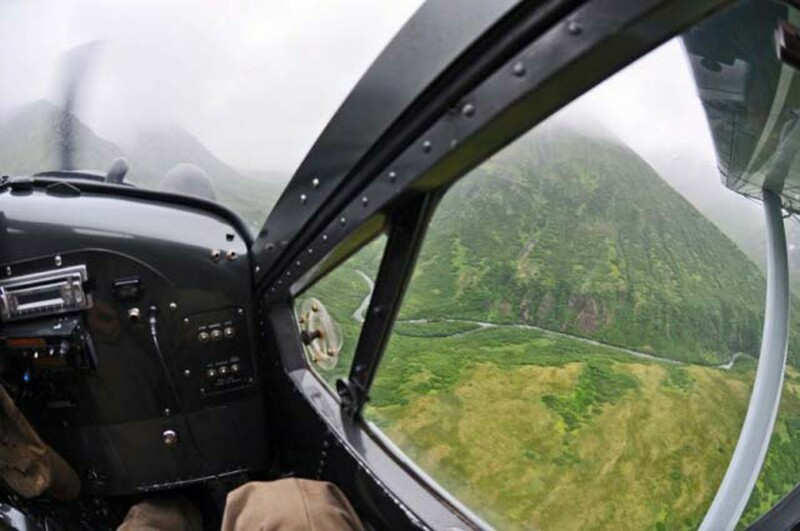 “It’s been raining continuously for 3 days but yesterday evening our pilot threaded his way through the clouds to drop us at the top of the canyon. The water is quite high and rose 6 inches last night coming within feet of our tents. The stage is set for high water conditions in the canyon. 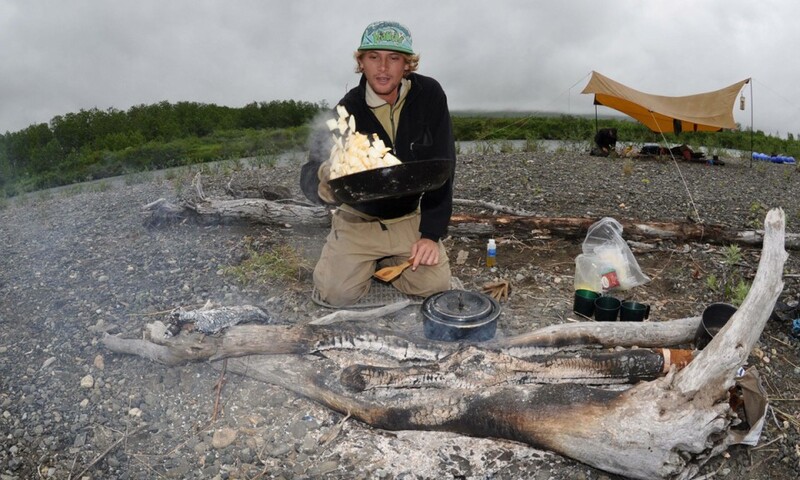 I don’t know whether that will help us or hurt us.” On put in morning I did regret that our tents and camp kitchen fly were soaking wet adding another 20 pounds to the loads. The mountains were shrouded in mist and fog. Ranges glimpsed beyond ranges. Peaks appearing and disappearing. The river picked speed in the upper 2 miles of class I-II riffles. Then the canyon steepened and we entered the crux, where 5 miles of pretty continuous maneuvers were needed to link lines through boulders gardens punctuated with holes. Bill’s job was finding “Clean eddies where even if we flipped and flushed out it wasn’t onto boulders.” In one such eddy Alex took 15 pounds out of my load and put it on his boat. What a huge performance difference it made to only have 65 pounds of gear! I didn’t crash through any more holes. Toward the bottom of the 5 crux miles, first Bill and then I passed through a challenging set of holes and standing waves. Then I turned my head out of concern that Alex with the heaviest raft might need help. 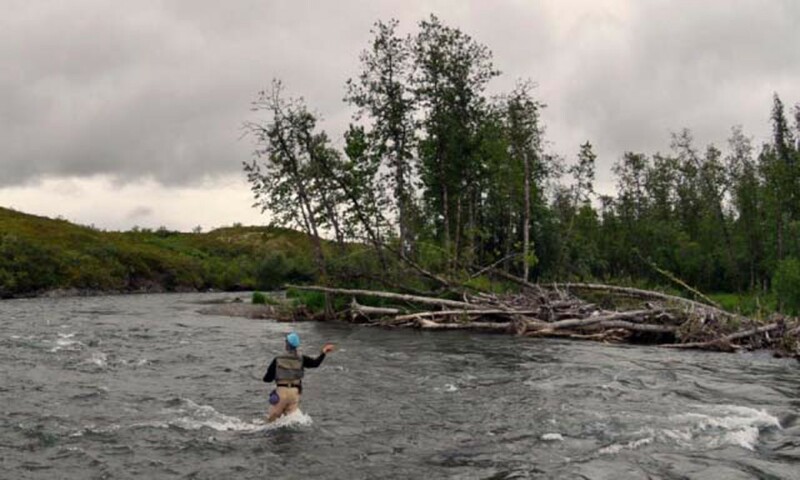 In the split second I turned and saw him blasting through the hole my raft flipped on an eddy line and I was swimming. Hanging onto my paddle, the boat, and rifle I swam to shore. Truly as the day wore on my adrenals became a bit depleted. I am not often as frightened as I was in those hours when we worked through the crux portion of that canyon. As beautiful as the canyon scenery was it was hard to enjoy until it was behind us. For safety we were committed to staying close together. Bill leading, I following through the holes, and Alex in the rescue / sweep position. The only time we were not in visual contact was if one of us was barging through a hole, or had stopped to bail, or if Bill rounded a bend in the river. Bill disappeared around a bend 30 yards ahead of me and I heard the horrific shouting that no-one ever wants to hear in Brown Bear country. “Bear Bear, Bear, Bear. Sow with cubs in the river!” The river although unruly was hardly more than the width of ones living room in mid channel, perhaps a little larger. Bill had come around a blind corner and run right into a sow with cubs. After the Bear incident the technical nature of the canyon relaxed and we enjoyed long stretches of Class II boating interspersed with a few major holes and wave trains. We’d been in the Alpackas for 8 hours through the beautiful canyon. For the next 6 days we enjoyed more canyons, although none were as technically challenging, just bigger water as the river picked up tributaries and grew to an estimated 2000 cfs. 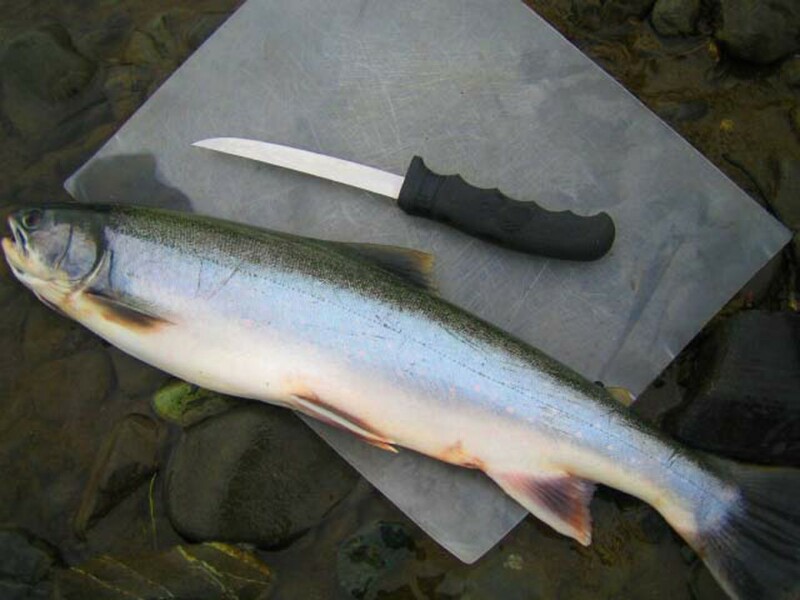 The log of August 1, 2010 mentions that Alex released 2 Dolly Varden in the 24” range and killed one for dinner which had a stomach full of fresh Chum Salmon roe. 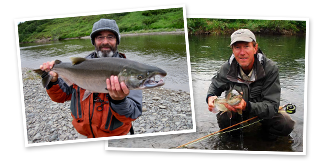 Bill released 2 large Dolly Varden Char, 1 Sockeye, and 1 Chum. 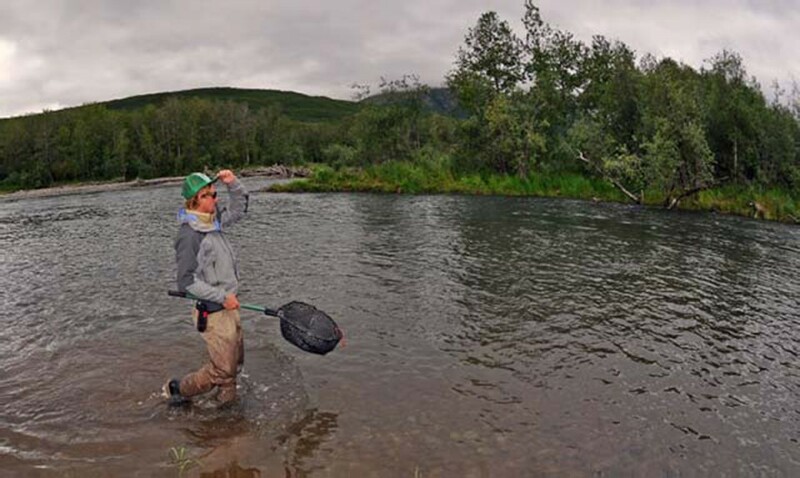 Strangely as we traveled the river we never again found fish after we left that one small Chum spawning area. 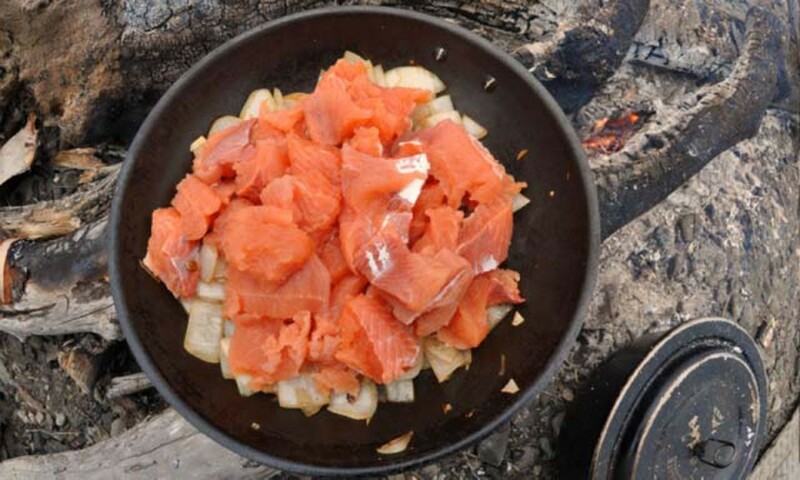 It was for the most part devoid of salmon and resident species too. 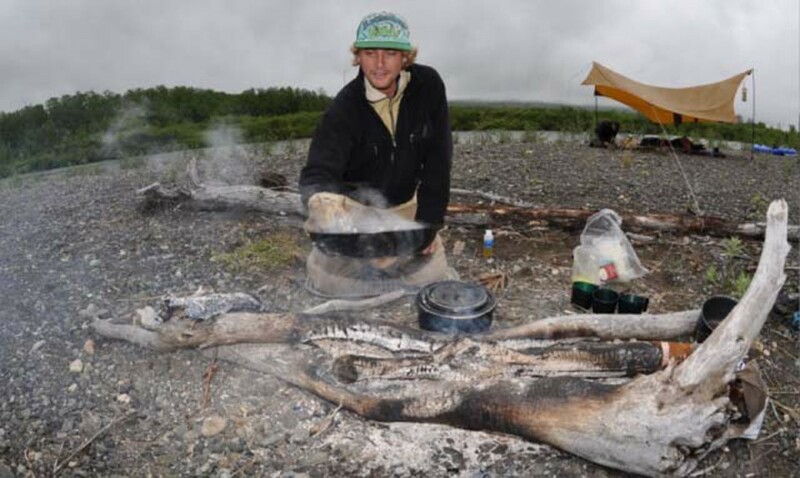 Days went by where we couldn’t have eaten Grayling for dinner! On August 2, I noted that we’d seen 4 Moose that day and a shorebird that I don’t often record, the Wandering Tattler. We’d come 39 miles total and seemed to have left the canyons far behind. Ahead of us a few miles was the Togiak River. 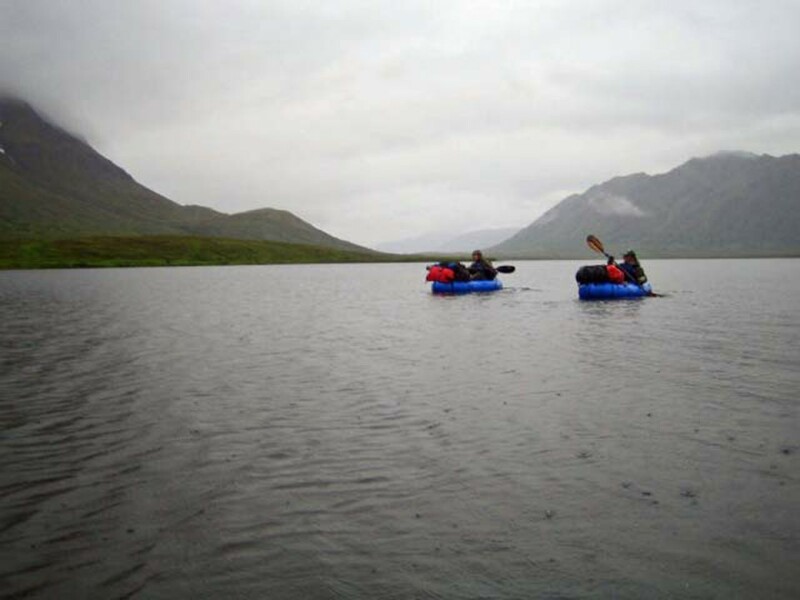 We’d learned a bit about the capabilities of Alpacka rafts. 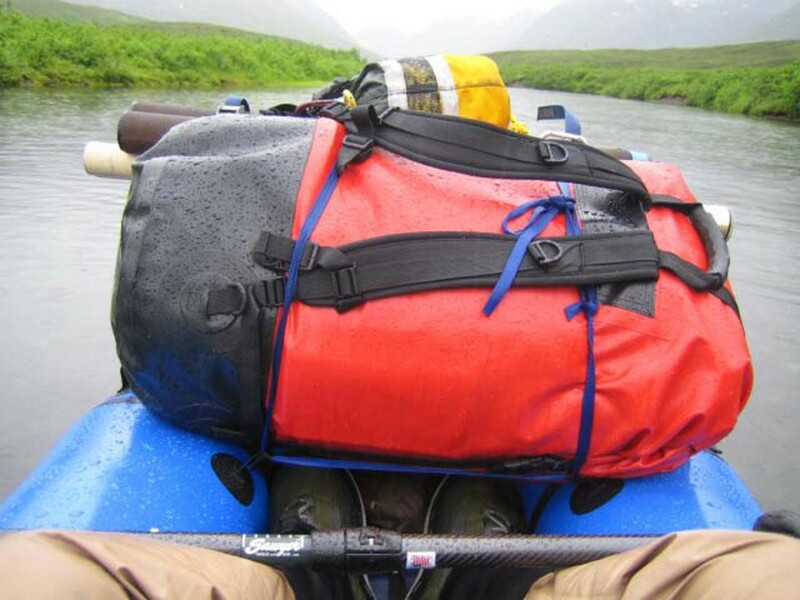 A few things that we’d do differently next time would be to keep the dry bag(s) weight to 60 pounds per boat. 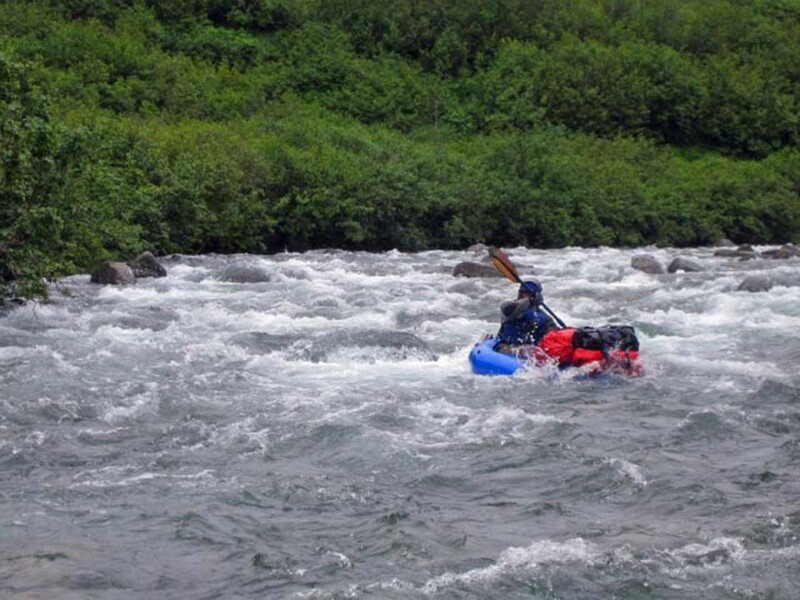 There is a night and day difference in whitewater handling characteristics between a 60 pound vs. 80 pound load in the raft. 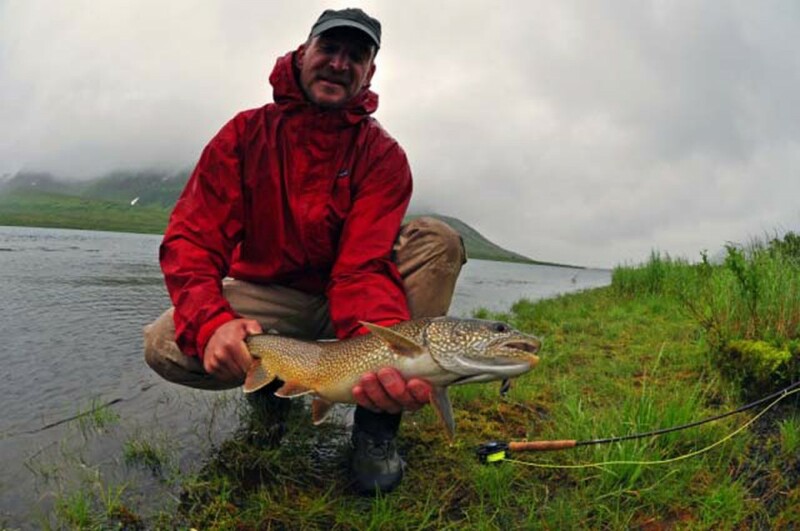 On the mighty Togiak 80 pounds was fine in the raft (I weight 170). I’d include a short barreled high powered rifle and scabbard that can ride atop the dry bag on a boat. The rifle I normally carry is just a bit long for the raft. 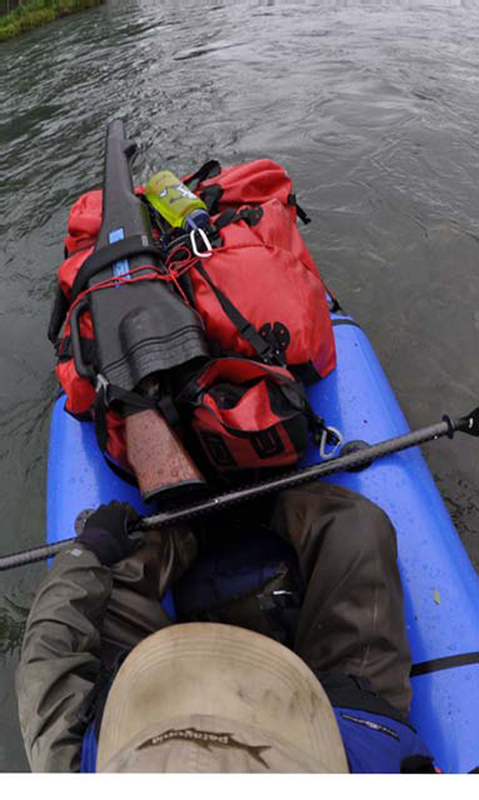 Also one’s bear spray should be attached to a lash tab near the left shoulder on your PFD (If you are right handed) because if keeping it on a waist belt, deployment would be questionable with a bear in the creek at close range. Under the water conditions in 2009 a helmet was not advised and the rafters wore chest high waders. 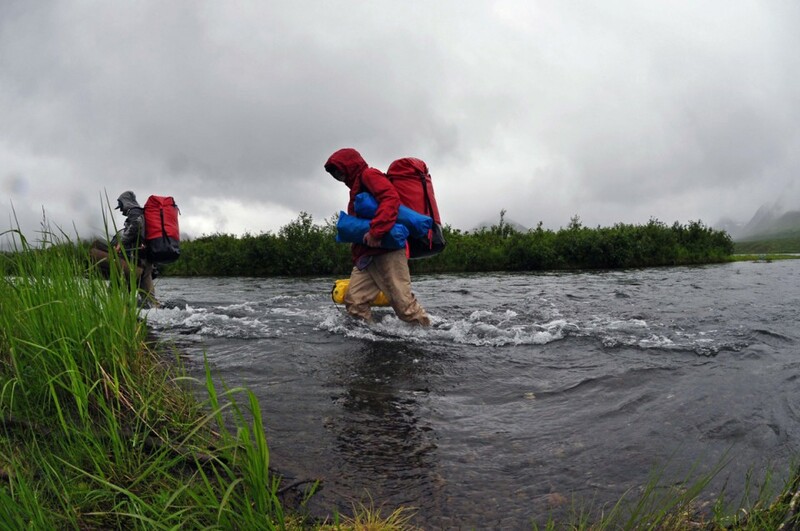 In 2010 we wore waders with tight belts and close fitting Gore Tex wading jackets. Bill wore a dry suit top. I swam twice, Alex once. We probably should have had helmets under the higher water conditions. Finally for these more technical small creek runs I’d prefer normal to low normal water for my own skill level. 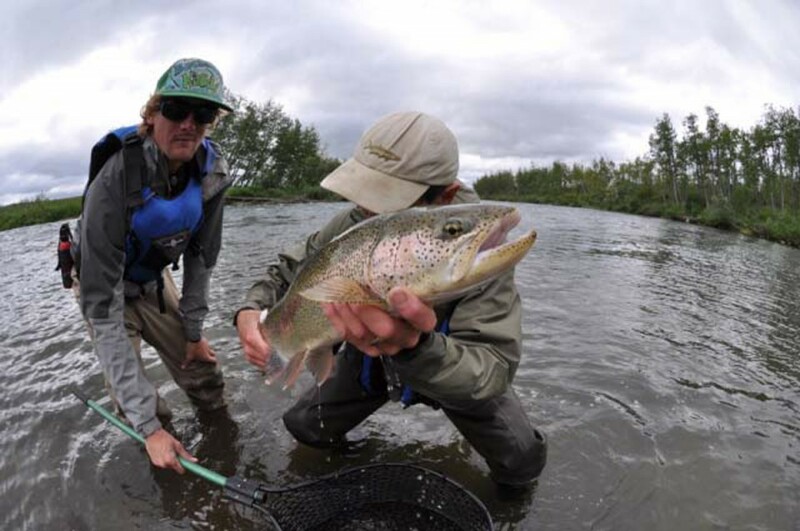 Over the past three decades, the trips I’ve made in high water have all turned out to be “white knuckle” plus the fishing suffers. If your “Plan A” creek trip falls in a high water period have a “Plan B” that involves a mid size river with a lake headwater source. 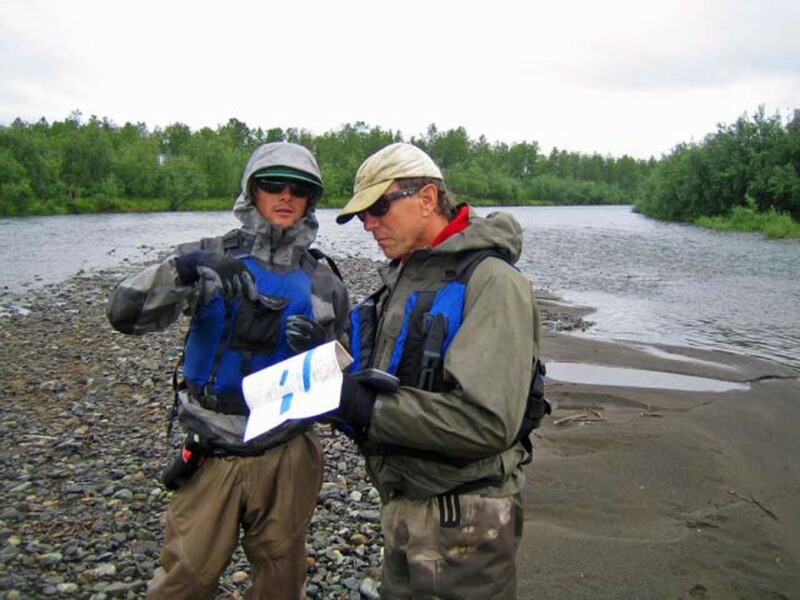 Still the most important thing to bring on an Alaskan exploratory trip beside good map set is the best partners you can find! See you out there.